Every morning, it's the coffee that gets the credit for kickstarting our day, but as the brews come and go, it's our mug that remains a constant. We develop a special attachment to the vessel whose function often goes overlooked. This week in the Bruer office, we have decided to start a new blog series that is going to be a bit of an experiment for us. The idea is to have you follow along as we design a new coffee mug (that enhances the experience of drinking coffee), giving you insight into the decisions we make from initial research all the way through to a finished product. Our initial goal is purposefully broad. We don't want to commit to anything before doing a little exploration first. The idea here is to learn as much as possible about coffee mugs while identifying problems with what is currently on the market to see what we can improve upon. Later, we will come back and set a more specific goal to guide us towards the finished product. However, we are going to narrow our focus of materials to ceramics. We have the resources available to us to do the whole manufacturing process in house, which will make it much easier to share every aspect of the project. Once finished, we plan to do a small run of mugs that we will make available in our web store. A few ceramic things we have made in the past. To start off, we want to learn as much about coffee mugs in general as possible. This way, when we take a look at what else is out there, we can have a better understanding of what led the design decisions. I drew up a quick sketch of "The Anatomy" of a coffee mug as an overview and serve as a road map. Temperature has an interesting effect on how we perceive the flavors in our coffee. As coffee cools down, we are able to notice different components just as melted ice cream tastes sweeter than frozen ice cream. The theory here is that our taste buds don't do as well when they encounter extreme temperatures, but they will work better when what we eat or drink is closer to body temperature. We also perceive different types of taste better at different temperature ranges eg. bitterness, saltiness, sweetness. You may enjoy the experience of tasting flavor change as your coffee cools or you might just like your coffee to stay really hot. Either way, there are a few components of a coffee mug that will influence how fast that temperature change occurs. There is an exothermic reaction occurring where the heat from you coffee is being released into the things around it. Some of that heat is being transferred into and though the walls of the mug. This is where the wall thickness of your mug comes into play. Thicker walls have more thermal mass than thin walls and will take more time to absorb heat from the coffee, but it will also hold onto that heat longer keeping the coffee at a higher temperature for a longer period of time. In the graph above, we poured equal amounts of hot water into two similar sized mugs with different wall thickness, and we measure the change in water temperature over time. You can see the water temperature in the thicker mug drops quicker at the start as it absorbs more heat into the walls. Once the mug has heated up, it retains that heat, and the thick walls also act as an insulator, keeping the water hotter for a longer period of time. The thin walled mug doesn't have as much thermal mass and equalizes with the water temperature quickly, but it also can not hold onto that heat for as long. The other more obvious factor for change in temperature is the size of the opening in the top of the mug. The more surface area the coffee has in contact with the air around it, the quicker the air can absorb the heat. Larger openings mean faster heat loss. Volume, or the amount of coffee in the mug, can be another variable. Just like with the wall thickness of the mug, a larger amount of coffee will have more thermal mass, but assuming you are actually drinking the coffee, this variable is constantly changing so it is not as easy to design for. Aroma and taste are two equally important aspects of your drinking experience. Together they make up flavor. Aroma is detected through your nose and the back of your throat while taste is mostly through your tongue. As you would imagine, the taste and aroma originate from the coffee itself, but the are a couple ways the mug can influence them. The aroma in our coffee comes from hundreds of volatile organic chemicals that evaporate at room temperature. ( here is a cool site I found that talks more about that ) With the internal shape of the mug, we can theoretically direct those volatiles in order to either focus or disperse them. With a curved walled mug, we can potentially focus aroma to the center of the mug right where your nose will be making the aroma stronger. Alternatively, a straight walled mug or a mug with a wide opening can disperse the aroma making it less concentrated. You may be wondering why we would chose one over the other. The idea is that certain coffee varietals have stronger or weaker aromas, and you may want to create a balance between what you are tasting and what you are smelling. For example, some less acidic coffees have more earthy tones that are not as noticeable and, by enhancing them, you can change the flavor of your coffee. Pretty cool! Side note: Directing aroma via the shape of the glass is very common in the wine industry as well. Manufactures design glasses for specific varietals taking into consideration aspects like aeration, the harshness of the alcohol, the way to focus or disperse acidity, and the appearance of the wine in the glass. I think there are definitely some parallels that could be considered for coffee drinking and maybe more specifically cold brew, but that might be too deep of a hole to go down right now. One thing I would like to share from my quick step into the wine world is that the edge of a wine glass is a very important component. The reason the edge is so thin is because they don't want the feel of it against your lip to distract from the wine. They also use the shape of the mouth to either direct the wine to your tongue or spread the wine into your mouth. This is something you can see in coffee mugs as well. In some cases, especially for more acidic coffees, you may want a thin lip to focus the coffee onto your tongue. Conversely, for a less acidic coffee, you may want a wide or thick lip to distribute the coffee all around your mouth. One more cross over with wine to consider would be swirling. When you taste wine you often first swirl it in your glass to introduce air, and release aroma before you take a sip. This can also have an interesting effect on coffee. A mug with a rounded bottom may be better suited to give this experiment a try. The look and feel of your cup are less scientifically quantifiable, but they are just as important. I am going to talk about this a lot more when we get into the actual design of the mug, but for now I will just go over some of the basics. Wall thickness of a mug plays an interesting part on how we perceive its quality. A heavier mug (thicker walls) will feel more durable, and it can create a more comforting feeling. On the other end, a thin walled mug will seem more fragile, but like a wine glass, it can feel more elegant. The shape itself can invoke certain emotions. A mug that fits in your hand well will be more comforting and enjoyable than an awkward shape. The classic diner mug has a homey feeling while a rounded mug might remind you more of siping espresso in a coffee shop. We will want to think about the environment in which our cup is going to be used when we start to think of the aesthetic aspect. Now that we know a little more about the attributes of coffee mugs, let's take a look at what's out there. I have collected a few examples where you can tell there was a lot of design consideration involved as well as some more common mugs below. If you follow the coffee industry closely, you probably have heard of Tim Wendelboe, and you may know he has already played around with the idea of cup shape influencing the experience of drinking different types of coffee. Along with Kristin Hærnes Ihlen from Physical Design, Tim created three cups designed to bring out the best in specific coffee varietals. You can read more about their designs here. If you frequent third wave coffee shops, chances are pretty good that you have had coffee out of one of Not Neutrals mugs. From the way it feels against your mouth to the amount of heat that touches your hand, they have put a ton of consideration into the experience that goes along with drinking out of their mugs. Check out this blog post explaining their designs. Manual is is a fellow Kickstarter funded company. These mug were originally an award included with the Manual Coffee Maker No1. Made from Borosilicate glass, there is a nice added visual component to the coffee drinking experience. The thin walls allow for quick temperature change, so you can enjoy the deliberate flavor change as you drink your coffee. More here. In the Bruer office these mugs by Mazama our some of our favorites. Besides being aesthetically pleasing, they feel pretty awesome to hold. They have a few sizes, but personally I think the small one holds the perfect amount of coffee. They also have slightly tapered sides which enhances the coffees aroma. More here. These mugs designed by Fellow have a couple interesting features. Most noticeably they are double walled, which is something we didn't get into when talking about temperature change. The Idea here is that air has a lower thermal conductivity than glass and by creating an insulating air pocket you slow down heat loss through the walls. These mugs also have a thin flared lip similar to a wine glass. More here. A few of the more common mug shapes you will find out there. Rounded Mugs are good for pouring latte art because of the smooth curved bottom, but often have wide mouths which release heat quickly. Diner Mugs are the classic go to for brewed coffee, and have a comforting feel with thick walls to keep your coffee hot for a longer time. Tulip Mugs are a sort of hybrid between rounded and diner mugs. The curved edge is ideal for pouring latte art, and the narrow mouth and thicker walls will help to retain heat. So with all of that in mind I have a few potential fun ideas for where we could go from here. 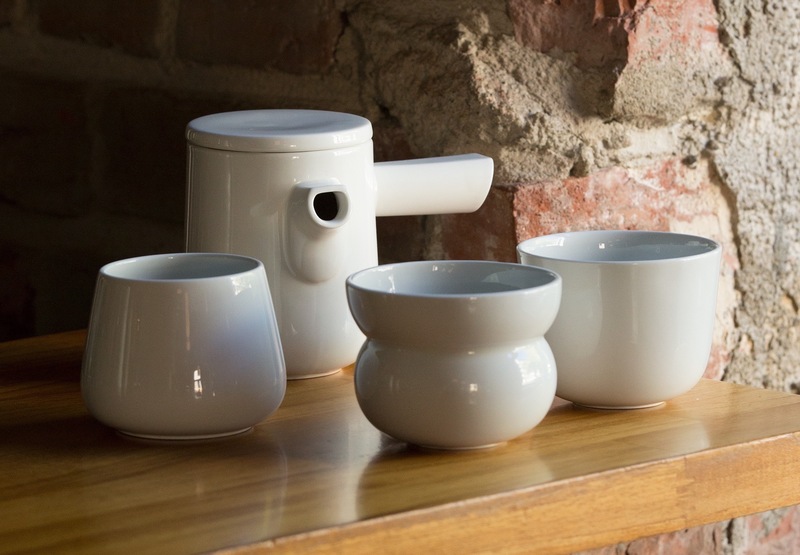 We could try to follow in the foot steps of Tim Wendelboe and design a cup that enhances a specific variety of coffee. Alternatively, we go for an all around approach and put some of our favorite mug characteristics together. I am also interested in looking at the similarities between cold brew and wine. Stay tuned for Part 2 where we will be refining our goal for the project, and hopefully begin on initial design and prototype testing. Thank you for reading! Please let us know if you have any comments, questions, or suggestions!